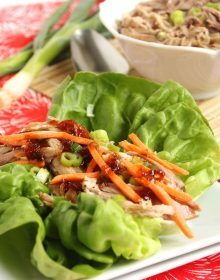 serve up this delicious slow cooker pork with sweet chili pineapple sauce! In a small saucepan, whisk together the pineapple juice, rice vinegar, honey, chili sauce and hoisin sauce. Bring the mixture to a boil and cook the sauce until reduced by half stirring with a heat resistant spatula frequently. Set aside. When the roast is done, transfer to a cutting board and shred the meat using two forks. Return the shredded meat back to the slow cooker and serve immediately with the sauce. Leftovers can be stored in an airtight container and frozen for up to 2 months.